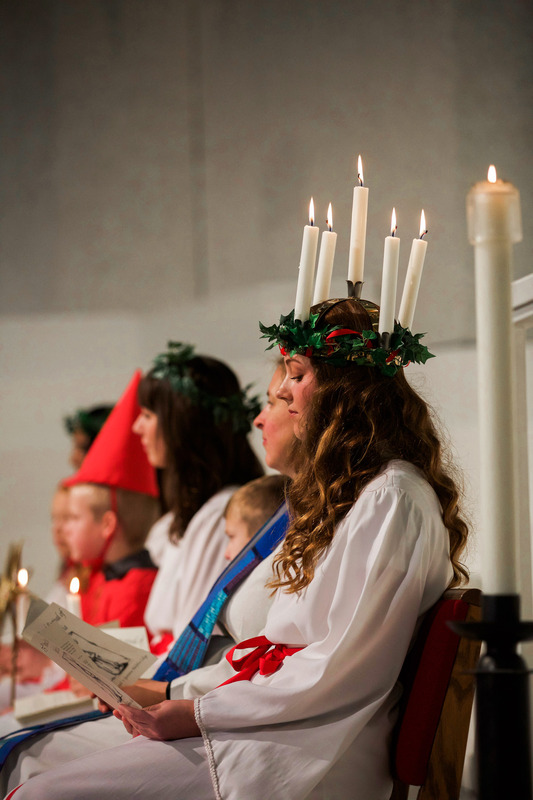 The Festival of St. Lucia, which is traditionally celebrated on December 13, begins the Christmas season in Swedish custom. According to Swedish legend, a ship carrying a maiden "clothed in white and crowned with light" appeared on the shore in Värmland during a great famine. The maiden, widely believed to be Lucia, distributed food and clothing to the needy, thus endearing herself to the Swedish people. As a school founded by Swedish immigrants, the Gustavus Adolphus College community has found it appropriate to celebrate some Swedish traditions. At Gustavus a St. Lucia Court sings carols through the residence halls starting at 5 a.m. The community is invited to a chapel service featuring the Lucia Court, singing by the Lucia Singers choir, and the previous year's St. Lucia providing a homily during which the legend is retold. The chapel service is from 10 - 10:30 a.m. in Christ Chapel, is free and open to the public and will be live streamed and archived. The service is followed by a Scandinavian smörgåsbord luncheon and program. The St. Lucia luncheon is coordinated by the Gustavus Library Associates (GLA), with invitations mailed to GLA members in mid-October and tickets going on sale in early November. To join GLA, contact the Office of Marketing and Communication at (507) 933-7520. To order tickets, visit gustavustickets.com.